Exotic species that establish, spread, and cause substantial damage are demonized as foreign invaders that charge with menacing force across the landscape. Rightly so; those pests threaten to displace or eliminate native species and alter ecosystem functions. Chestnut blight, emerald ash borer, and hemlock woolly adelgid are all excellent examples. What about invaders that aren’t so destructive? Or, at least don’t seem to be at the moment? At what point do we stop monitoring a seemingly innocuous invasive species, especially one that has proved itself a serious pest elsewhere? To make this decision, it’s helpful to know how much the species has affected its new habitat, and whether this impact already has or is likely to change over time. That is exactly what we set out to do with the European woodwasp, Sirex noctilio, in Ontario. Nearly a decade after the woodwasp was first found in a trap near the Finger Lakes in New York (and then a year later across Lake Ontario in Sandbanks Provincial Park), it still hadn’t killed pines in noticeable numbers, either in the US or Canada. Native to Europe and Asia, this woodwasp has been introduced to several countries in the Southern Hemisphere, where it has been a serious pest in forests planted with exotic pines. By contrast, in North America, it seems that only the weakest trees, those that are already stressed by something else, are killed by the woodwasp. Would forests with many weakened trees allow populations of the woodwasp to build up enough that they could then kill healthy trees in well-maintained forests? Could we find any evidence that this had already happened or would likely happen in the future? Our goal was to measure the impact the woodwasp has had in Ontario, and whether that has changed over time, by closely examining the same trees in pine forests every year. First, we had to find sites where the woodwasp could be found, which wasn’t every pine forest, and where landowners would allow us to work. We were not interested in sites that were well-managed, because research had already confirmed that the woodwasp was not present in those forests. We used records of positive woodwasp captures from the Ontario Ministry of Natural Resources trap survey as a guide. We visited 50 potential sites, and eventually selected eight for close scrutiny in our long-term study. These sites were areas where there was likely to be intense competition among trees for resources, with plenty of stressed trees for the woodwasp. The European woodwasp was probably absent from a well-managed red pine forest (left), but likely to be found in an un-managed scots pine forest (right). We visited all eight sites every fall from 2012 to 2016, after woodwasps had the opportunity to attack trees. Adult woodwasps mate and lay eggs, attacking trees in the process, in mid-summer. Attack was visible as distinctive resin beads scattered over the trunk. We recorded which trees had been attacked, and later (usually the following year) killed by the woodwasp. The woodwasp population was considerable at some of our sites, having killed about one-third of the trees within five years. Though at other sites, the population was much smaller, having killed only a small percentage of trees. We’re not exactly sure what caused this variability. It’s possible that the woodwasp arrived at some of our sites years before it arrived at others, and the most vulnerable trees were long dead at the sites it invaded earlier. We have no record of time since woodwasp invasion at any of our sites. It’s also possible that local environmental conditions, which we did not measure, could in some way have affected tree resistance or the woodwasp population. Most curious, though, was that over the five years many trees attacked by the woodwasp did not die – around 50 to 80%. At least half of these trees were attacked again and again in successive years. We had captured an interesting part of the woodwasp’s ecology, its way of essentially priming trees to become better habitat for its young. When laying eggs, female woodwasps also inject a self-made toxic venom along with a symbiotic fungus into the tree, to help kill it. If the tree is sufficiently resistant to attack, the female may not lay eggs, only the fungus and venom. The fungus and venom then work in concert to weaken (prime) the tree for re-attack – and hopefully successful colonization – in subsequent years. Female woodwasps sometimes die while laying eggs. Survival of the fittest? Two-thirds of trees that were attacked by the woodwasp at some point in our study (one or more times) did not die, which shows that most trees selected by the woodwasp as suitable habitat are at the moment resistant to its advances. This also shows, along with the variability in woodwasp impact among sites, that this invader is active in the forest. Should environmental conditions change (say, if a drought occurs), woodwasp populations could quickly rise to outbreak levels, which could kill large numbers of healthy pines. This has happened in other places. Long-term study of these sites, and hopefully others, is needed so that we can be aware of changes that arise in woodwasp impact. This will allow us to be proactive about what steps to take to manage this invader, should it become a problem. It will also help us better understand and predict what causes exotic species to vacillate on the spectrum between aggressive invader and innocuous resident. Want to read more? Check out the original article published in The Canadian Entomologist, which is freely available for reading & download until May 14, 2018.
http://esc-sec.ca/wp-content/uploads/2018/04/sirex.killed.jack_.pine-16x9.jpg 2250 4000 Blog http://esc-sec.ca/wp/wp-content/uploads/2017/01/ESC_logo-300x352.png Blog2018-05-01 15:56:092018-05-01 15:56:09When should a non-aggressive exotic species be demoted to a harmless naturalized resident? Growing up is a continuous lesson in assessing risks. In my case, those risks included going for a double salchow with the risk of taking a bad fall, pushing my limits on my bike with the risk of an accident around every corner, or choosing an insect-filled educational path that was once considered risky for girls and women. But with these risks come opportunities, and learning which risks are worth taking, and which are best avoided, is a critical lesson we all learn through experience and opportunity. Luckily for me, I survived the risks I took, and the lessons they taught me prepared me for a job that I love. For the last decade, I have been an Evaluation Officer with the Pest Management Regulatory Agency (PMRA), the pesticide-regulating wing of Health Canada. In an effort to join the #scicomm science communication revolution, I want to do a better job of explaining what I do. No, I don’t pop a wheelie on ice while wrangling bees in a forest, but I do work that is almost as interesting. I said *almost*. What DO you do, then? I deal with pollinators of the insect kind. I look at how pesticides affect bees that collect and move pollen from male and female flower parts. This process is called pollination and it helps to produce fruit like apples. Pollinators are vital to not only Canada, but to the entire world’s food supply. I assess pollinator pesticide risk, which means I analyze research from some Entomology Society of Canada members as well as the greater pollinator community. With a team of scientists, I dissect the data from research studies and organize it around a risk assessment framework. The framework holds up the data so the team can see ALL of the highs and lows of the risk. From here we can step back and take in the whole risk picture gallery. From the picture emerges a Pollinator Risk Management Plan that can be put in place to help safeguard our bees and food. Every day, we take what are deemed acceptable risks like driving a car at high speeds, and we try to prevent unacceptable risks like contracting measles that could affect our families and ourselves. Deciding which risk is worth taking can be overwhelming. My risk assessing jam is The Risk Song by Risk Bites. It both winds my gears and chills me out. Our method to assess risk is a lot like grinding through bike gears from smallest to largest. A better way of explaining this is by writing about going for a bike ride. But not just any bike ride, a big one like a Century Bike Race where you ride 100 km in one day, something I hope to accomplish this summer. A Century Bike Race is risky, but like anything, it can be assessed and a plan developed to manage the risk. To assess the risk, I first completed 3 tests as I trained on my bike. Like steps, each test relied on the one before to gather information on the risks. The stepped tests (or tiers as we call them in the risk assessment world) start very basic and move toward a more realistic set-up closer to mimicking the actual bike race. At each step, if an effect was seen (or a risk identified) another test was completed. TEST: Emergency stop or trying-to-stop-quickly-from-a-fast-speed. EFFECT = Falling over. This might be the fastest (unintentional) way to end my race. TEST: Riding with the flow in a group of cyclists with bikes in front, behind and on both sides. EFFECT = I wobble side to side as I ride. No one wants to ride beside that. TEST: Entering some shorter bike races. EFFECT = I have never done a bike race before. *NOTE: I have competed in short distance triathlons, but ask any roadie about how these don’t count*. Bike racing seems a little like running with bulls, except with extra metal, spokes and wheel parts. Ouch. It’s not enough to list effects seen from my bike race “tests”; I need to know about the race. I need to know details about what I could be exposed to during the race. This could include the road conditions, the type of race, the timing of the race and so much more. If my bike analogy is still lost on you, connect with me on Twitter and I’ll try comparing it to landing a double axel instead. In the meantime, here’s a handy interactive infographic to explain the risk assessment process using caffeine as an example. Just like with my bike race we use a framework to compare the effects with the exposure information but there is more to consider that can complicate the process. We also strive to understand the natural history of pollinators and the way crops are grown and harvested in Canada. This crucial information is then overlaid on the exposure information and the effects seen. This melding together of ALL the collected information results in, you guessed it, a Pollinator Risk Management Plan. Working with pollinators has taught me that nothing is as straightforward as it seems. The science changes all the time, as do the risks as we learn more about bees, their behaviour, and how plants are grown in Canada. There is one thing I do rely on, and that is how pollinator work is NEVER boring. I will admit that the headline was thoroughly and completely “click bait”. That’s because I was worried that “The new ESC Science Policy Committee and its mandate” would have you move along to the next article. And I hope that giving you the goods now on what this article is about doesn’t cause that right… now. For those of you who are still with me, and I hope that is a majority of our members, I am aware that policy is not generally considered an exciting topic. But in this era of climate change, environmental degradation, increasing population pressure on our agricultural and silvicultural output, emergent and spreading vector-borne diseases, research funding challenges, and rapidly shifting politics in Canada and many of our largest trading partners, we as entomologists cannot merely sit back and let policy happen. We need to engage with policy makers to encourage careful decision making with the long view in mind. Our diverse Society membership has an equally diverse set of skills and perspectives to offer to Canadians and the rest of the world. But engagement can only happen if we are willing to put fingers on the pulse of various issues, and to collaboratively marshal responses to issues as they begin to emerge. In other words, we can only be effective if we are able to anticipate in time and react with collective care and wisdom. drafting the ESC Policy Statement on Biodiversity Access and Benefit Sharing which was later adopted by our Society. However, because the combination of both public education and public policy was a substantial and growing mandate, the ESC Executive Council Committee decided in 2015 to split the committee into two, each part taking care of one of the two former aspects. We are now working on putting together an agenda, and have started to work on a few items. For instance, you may recall an eBlast requesting participation in Canada’s Fundamental Science Review that was initiated by Hon. Kirsty Duncan, Minister of Science. We hope that some of you took the opportunity to send your thoughts to the federal government. What policy-related issues do you see emerging in your area of study, your realm of employment, or in the place that you live? How might the ESC Science Policy Committee integrate better with your concerns and those of the rest of the membership? How can our Society be more consultative and responsive to the membership and to issues as they arise? Who are the people and organizations with which ESC should be working closely on science policy issues? How can you be a part of science policy development, particularly as it relates to entomological practice and service in Canada and abroad? Please email me at huber@unbc.ca with your thoughts, questions, and ideas. We know that many of you are already involved in this type of work, and we hope that we can act as synergists to your efforts and that you can help to further energize ours. This article also appears in the March 2017 ESC Bulletin, Vol 48(1). Six temporary positions based in Guelph, Ontario for up to 18 weeks are available. Closing date is February 2, 2017. See flyer for more details and how to apply. Interested in working with agricultural research entomologists in Saskatchewan? Agriculture and Agri-Food Canada is hiring! Learn more about this position and apply on the AAFC website. L’Agence canadienne d’inspection des aliments (ACIA) a récemment publié une offre d’emploi pour deux postes de chercheurs scientifiques, dans les domaines de l’entomologie (Entomologie vectorielle & Taxonomie moléculaire des insectes). Veuillez trouver le lien menant à l’offre d’emploi, advenant que ce soit une opportuniqué qui vous intéresse.https://emploisfp-psjobs.cfp-psc.gc.ca/psrs-srfp/applicant/page1800?poster=966937&toggleLanguage=fr Merci pour votre consideration! Date limite: 26 octobre 2016. 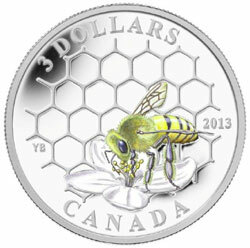 The Royal Canadian Mint’s “Animal Architects” Coin Series Celebrates Insects and the ESC! A year ago, an exciting new collaboration was initiated between the ESC and the Royal Canadian Mint. 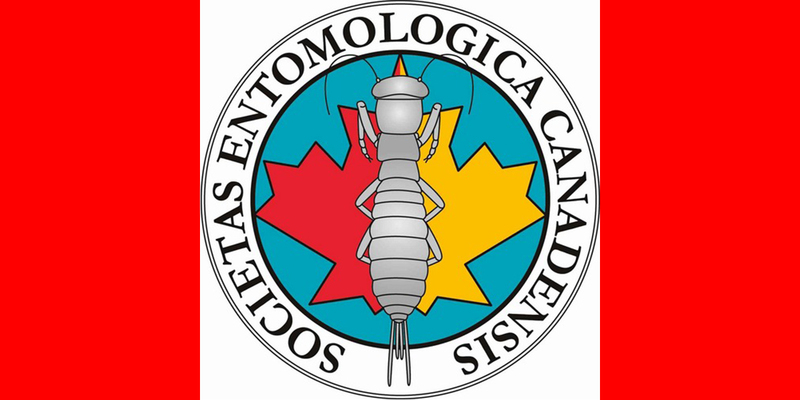 This collaboration grew from a letter sent by then President, Michel Cusson, and myself as chair of the Scientific Policy and Education committee, to the Mint commending them for the inclusion of insects on Canadian coins and offering the services of the ESC as a resource for the development of future insect coins. The response from the Mint was very warm and they immediately invited the ESC to be involved in the Animal Architects coin series. The Animal Architects coin series celebrates the “exceptional architects of Canada’s animal world and their unique constructions”. I was thrilled to see that the first coin in this new series has recently been released, depicting an iconic insect architect, the honeybee, with its hive. The Mint also decided to recognize the involvement of the ESC in this series and, in 2013, to commemorate the Sesquicentennial of the ESC on the certificates of authenticity that accompany the coins. The Bee & Hive coin has proven to be extremely popular and is selling rapidly. The depiction of insects on coins helps to increase appreciation for nature in general, and insects in particular, among the Canadian and coin-collecting public. I hope you will consider supporting this endeavour by treating yourself or a loved one to one or all of the coins in this series. I’ve got my Bee & Hive coin reserved and am rushing off to Toronto tomorrow to collect it! http://esc-sec.ca/wp/wp-content/uploads/2017/01/ESC_logo-300x352.png 0 0 Morgan Jackson http://esc-sec.ca/wp/wp-content/uploads/2017/01/ESC_logo-300x352.png Morgan Jackson2013-05-30 17:12:072017-10-19 20:59:28The Royal Canadian Mint’s “Animal Architects” Coin Series Celebrates Insects and the ESC! By Scott Meers, Insect Management Specialist, Alberta Agriculture and Rural Development. My role as an entomologist with Alberta Agriculture and Rural Development consists largely of counting insects. We monitor the populations of seven different species on a provincial scale and several more on either an ad hoc or regional basis. We also carry out surveillance for potential new insect pests in crops. It is important to note that Alberta is a relatively large place, ranging 1066 km south to north and is 466 km at the widest. There are over 10,000,000 ha of land devoted to crop production. We do our monitoring work with two permanent staff and 2 to 3 summer students. The first thing that becomes obvious is that we can’t do this work by travelling the entire expanse of the province. So we must communicate with those that are out in the fields and capture the results of their “footprints in the field”. Through various reporting systems we have had good success in developing a representative monitoring system. Check out our homepage at www.agriculture.alberta.ca/bugs-pest. So where does Twitter fit in? In the two years that we have been using twitter we have collected nearly 800 farm related followers. Twitter is a great place to announce the results of our findings. If a set of traps or online reporting systems are reporting a concern we tweet it. The impact is instantaneous and widespread. Followers retweet (it is common for our in-season tweets to have 5 or more retweets), they ask questions, they check their fields and they let us know if their findings match ours. Talk about impact and talk about a reality check, it is awesome. We can then improve the quality and accuracy of the information we present. We announce our new extension materials on Twitter. If we have a new You Tube video, radio broadcast (weekly during the growing season), new web page or even a chnage to our homepage, we tweet it. It is at least part of the reason we have over 2,000 hits on how to put together our Bertha Armyworm traps (we only put out 200 sets of traps across the province in 2012). A big part of integrated pest management is the timing of insect activity. We have models for some insects and when they are supposed to be in their active scouting stage we tweet about it. Again instant feed-back! This helps us adjust and time our monitoring efforts to maximum efficiency. For those insects we don’t have models for we suggest timings based on experience. Agrologists and farmers tell us when they start seeing them. Again, awesome! Through Twitter we know when and where insects are showing up across the province. I am happy to retweet any credible source on insect activity and give credit where credit is due. A couple examples of this revolve around an outbreak of bertha armyworm (BAW) (Mamestra configurata) in central Alberta in 2012. 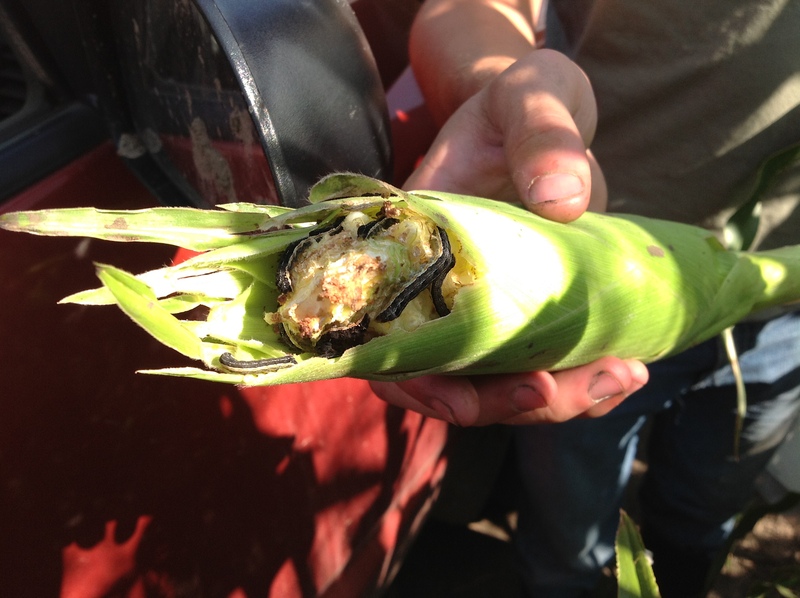 One case involves a comment about BAW in corn which is very unusual, partially because we have very little corn, and partially because BAW generally feeds on broadleaved plants. The conversation drew the attention of neighbors that were growing corn and they asked to see the field while we were inspecting it. The bottom line: the BAW laid their eggs on lambsquarters which was uncontrolled under the canopy. The neighbors that had control of the lambsquarters had no BAW. Thanks to @landrashewski. BAW in corn. Started on and ate all the lambsquarters then moved onto the corn cobs. The second case was BAW in field peas, another relatively rare situation. The pictures tell the story though. There was substantial damage. If we have another BAW outbreak we will be sure to encourage producers to check their pea fields as well. Thanks to @Klams81. Surveillance is where Twitter really shines. Last year I didn’t keep track of the requests for ID via Twitter but it was constant throughout the summer. There was a trend and repeats to the requests and there were questions about insects that we seldom see but were more common in 2012. Twitter gives us a chance to be in fields virtually. This a huge advantage because we can’t always be there in person. We have also used Twitter to help us find fields to survey and to get permission from producers to access their fields. In addition we have recruited help from agrologists and farmers through Twitter. When we ask they are often happy to help us because they have been following us and the work we are doing. We also have several examples of people joining our monitoring network because of finding us on Twitter. In short, Twitter is a valuable tool for monitoring insects in our program. We use it extensively. We welcome everything from the virtual coffee shop conversations to the private requests for identification. Twitter is, and will continue to be, an integral part of how we monitor insects in Alberta crops. It is good to be a part of the community and to give and receive in equal measure. We are looking forward to seeing what Twitter will bring in the new crop year! 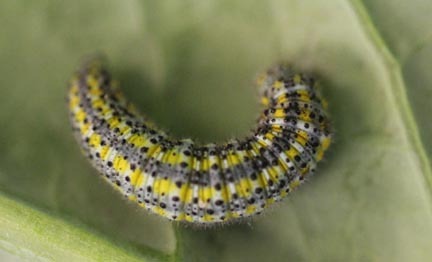 What is this – a common Twitter question to @ABbugcounter last year. We reared it out and it turned out to be Pontia protodice or Checkered White Butterfly. 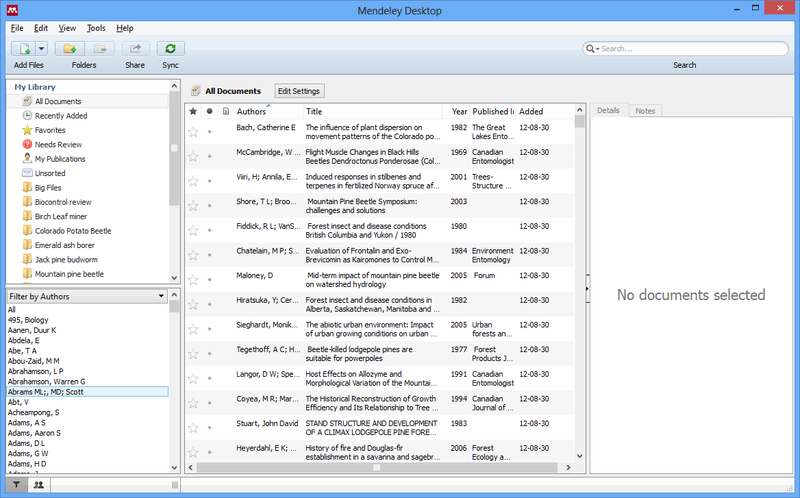 I recently switched over to the Mendeley citation manager after many years of being a loyal EndNote user. I’m liking Mendeley, but one thing I lost in the switch was the collection of custom citation styles I had put together during my MSc, PhD and Post-doc. This wasn’t a problem until this week when I was preparing final edits on a manuscript for The Canadian Entomologist. 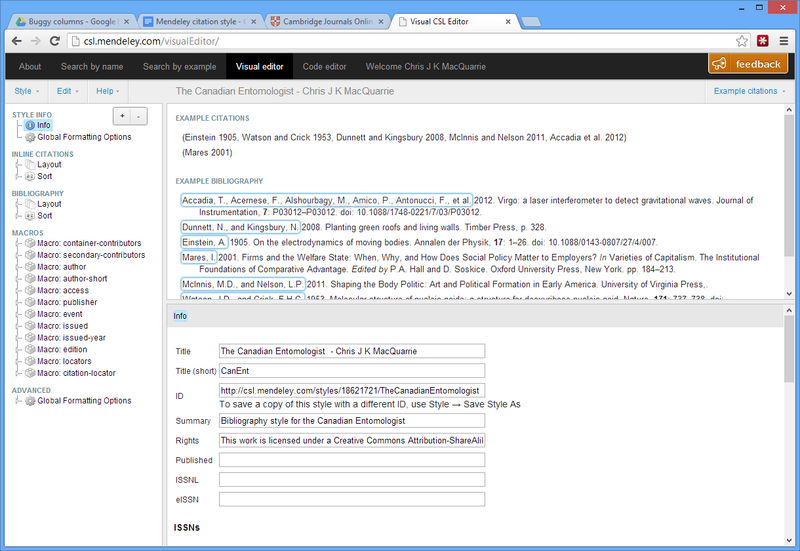 Mendeley didn’t have a style for TCE, but what it does have is the ability to modify existing styles and create new ones. I started with the existing style for the Canadian Journal of Fisheries and Aquatic Sciences because it’s an old stable-mate of TCE from the NRC press days and has a very similar citation style. to modify the CJFAS style to output what TCE requires in it’s reference section.The only ‘big’ difference I could find between is that TCE uses a comma after the journal name where CJFAS does not. I also made a few changes. For instance, the CJFAS style didn’t have a output for theses so I created one for that reference class. I also modified a few of the settings to delete information that CJFAS needs but TCE doesn’t. Now, what’s neat, is that Mendeley’s citation styles are based on the open-source Citation Style Language so you can use this style in any citation management program that also uses CSL (e.g., Zotero and Papers). A disclaimer. I hacked this together in a few hours and didn’t check all reference classes, so your milage may vary! As always, check your references section carefully before submission! If you do spot an error or have a suggestion let me know here, on Twitter (@cmacquar) or at cjkmacquarrie@gmail.com. William R Maples’ Dead Men Do Tell Tales: The Strange and Fascinating Cases of a Forensic Anthropologist, created a lasting memory for me. Aside from the fascinating science, Dead Men Do Tell Tales underscored that passion and resourcefulness is the key to learning. With an interest in blowfly ecology and ectoparasites, I set out to study these two fields as side projects during my graduate research at University of South Alabama (MSc) and Clemson University (PhD). Yes, “side projects” is a phrase that can send any supervisor running in fear, but I was lucky. During my research on black fly larvae and their gut fungi in Alabama, I initially thought that the undersides of bridges (easiest place to look for streams and black flies; #overlyhonestmethods) are where headless white-tailed deer went to die. These morbid scenes of poaching were both a source of amazement and one of convenience – easily accessed streams with black fly larvae accompanied by robust populations of blowflies and louse flies (my first sight of the very cool Lipoptena mazamae). These deer were just a gateway carcass, leading to a downward spiral of seeking out additional species of dead wildlife and their ectoparasites. I was now a roadkill prospector. Realizing that I needed experience with ectoparasites, prior to starting research on biting flies and ectoparasites of South Carolina zoos, I turned to the sometimes flattened, bloated, and unrecognizable critters I saw on my daily drive to campus. Equipped with latest intelligence on a fresh carcass, all I needed was a garbage bag, latex gloves, and a vehicle. Roads pose a real threat to animal populations. The numbers are staggering, as reported by @TetZoo or Darren Naish in Dead Animals at the Roadside. In Belgium, an estimated 230,000 and 350,000 hedgehogs fall victim to vehicles per year. Not exploring this biodiversity source would constitute a wasted opportunity. Insects and roads do not mix either. In Japan, a study of two routes resulted in 5000 dead insects per kilometer, collections dominated by Coleoptera, Lepidoptera, and Diptera (Yamada et al. 2010). Roadkill are ideal subjects for biodiversity studies (the vertebrate hosts, along with their ectoparasites and internal parasites). As One Health opens the doors to collaboration between the fields of human medicine, veterinary medicine, and the environment, scientists often remain confined in their respective silos. Roadkill offers a potentially important source of data on zoonoses and generate collaboration between veterinarians, entomologists, microbiologists, ecologists, and others. Interest in roadkill science is about as old as the automobile, albeit slower wildlife succumbed to horse drawn carriages of the 1800s. AW Schorger had more than a passing interest in roadkill, identifying 64 species of birds from 1932 to 1950, on the same roads between Madison, Wisconsin and Freeport, Illinois. Avian roadkill was dominated by English (House) Sparrows (N = 2784), Red-headed Woodpeckers (389), American Robins (310), Ring-necked Pheasants (271), Screech Owls (235), and Northern Flickers (230). Imagine the possible research if Schorger had a curious entomologist to tag along on these trips and to inspect each bird. Transportation ecology is a relatively new field that looks to study how wildlife interacts with our roads and how road design can minimize wildlife impact. The University of California Davis and partners have established a citizen-science project that allows the public to report roadkill on California highways, California Roadkill Observation System (see Maine and Idaho). Championed by the Toronto Zoo, the Ontario Road Ecology Group looks to combat the impact of roads on biodiversity in southern Ontario. Yet another is the South African initiative Wildlife Road Traffic Accidents – A Biodiversity Research Project. These programs offer an existing infrastructure that provides the basis for longitudinal studies of ectoparasites and their hosts. Aside from the basic understanding of host-ectoparasite relationships, roadkill are increasingly becoming a tool for hypothesis testing. A few examples are worth mentioning here. The Cardiff University Otter Project provided road-killed otters to test hypotheses surrounding otters, ticks, and climate. The prevalence, but not intensity, of the tick Ixodes hexagonus infestation on otters was associated with higher Central England temperatures, while both prevalence and intensity were associated with positive phases of the North Atlantic Oscillation. Without roadkill, we would not know that as lice burden increases in barn owls, the number of pectinate claw teeth decreases and bill hook length increases (Bush et al. 2012). Bush and colleagues also noted rodent ectoparasites on barn owls; e.g., the louse Hoplopleura acanthopus (normally found on rats) and the flea Malaraeus telchinus (from mice and voles). Is this a potential example of incipient evolution through host switching? When you open up an animal, there is all kinds of awesome in there.